Bowling Green, Ky. – October 19, 2016 –The Bowling Green Area Convention & Visitors Bureau gift shop is now selling the 2016 Hestia holiday collector ornaments. Created once a year and featuring a Warren County landmark, the Hestia ornament collector series features over 17 area hotspots, like Beech Bend Park, Lost River Cave, SKyPAC, Circus Square Park and more. Hestia collectors will have the unique opportunity to purchase two 2016 collector ornaments this year. One Hestia ornament features the Downing Museum at the Baker Arboretum, which is one of the area’s newest attractions featuring original artwork by WKU alum and Horse Cave, Ky., native, Joe Downing. The Downing Museum sits atop the Baker Arboretum’s scenic 115 acres. 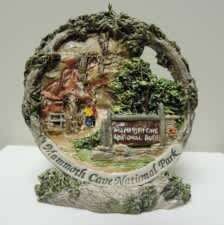 The second Hestia for sale is a limited edition Mammoth Cave National Park ornament commemorating this extraordinary year of anniversaries for Mammoth Cave. 2016 marks the 200th anniversary of cave tours, the National Park Service’s Centennial celebration, the 75th year of Mammoth Cave being a National Park, and the 35th year of the park’s designation as a United Nations Educational, Scientific and Cultural Organization (UNESCO) World Heritage Site. Hestia ornaments are $25.95 each and can be purchased at the Bowling Green Area CVB gift shop located at 352 Three Springs Road. Business hours are Mon-Fri 8 a.m. to 5 p.m. 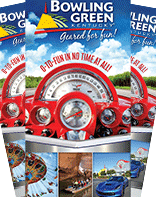 Please call 270-782-0800 or visit www.visitbgky.com for more information.